A Night AMOK: Pictures of Jesus is a presentation designed to help people come to know and follow Jesus and help those who already know Him to use their gifts to honor Him. As people created in His image and called to be His ambassadors to the rest of the world, Jesus looks like us. We are all Pictures of Jesus! Learn more. 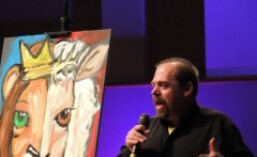 This entry was posted in Speaking ministry and tagged a night amok, amokarts, arts, creative, Gospel, ministry, pictures of Jesus, presentation. Bookmark the permalink.